This is a quick tip for Mac OSX users. The Sidebar on Mac OSX is this area that every Finder window has—that is, if you select View > Show Sidebar on the Finder. In it you can place files, folders, and volumes for easy access, by just dragging them in there. A kind of alias is created on the fly. To remove them, press Command and drag them out of the Sidebar. 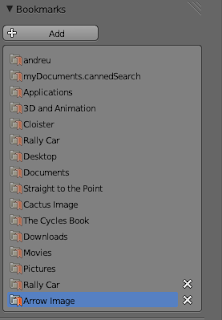 For a while, I wondered where the non-removable bookmarks in the Bookmarks panel on Blender's File Browser came from. Of course, you can create your own bookmarks by browsing to a folder and pressing Add. However, there are these other bookmarks I can't remove. Where do they come from? I just discovered that Blender accesses the items on the Mac OSX Sidebar and places them in the Bookmarks panel in the File Browser. I know it's a silly tip, but it feels good knowing you can control its contents. This is what my Sidebar looks like. These are the bookmarks on my File Browser window.